Though Sommers of Weimar is credited with inventing the Euphonium circa 1843, this instrument represents the culmination of earlier experiments dating back as far as circa 1820. Like the tuba, the euphonium is an instrument possessed of great range- about four full octaves in the hands of a player capable of making full use of its attributes. Some consider the euphonium to be a B flat tenor tuba; others claim it to be a tenor or baritone Fluegelhorn; still others have mistakenly claimed that the euphonium was a Sax invention, or a derivation of a Sax instrument. 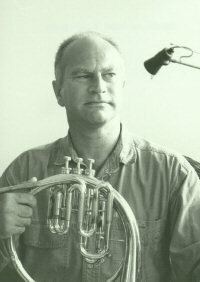 Since Fluegel instruments have a comparatively limited range, marked by instability and general lack of responsiveness in the third octave (this includes all Fluegelhorns, ballad horns, vocal horns, Koenig horns, and related instruments), and since the tuba, like the euphonium, has a far greater range than most brasswinds, the tuba connexion seems most plausible. The Sax connexion is erroneous because it is based upon a miscomprehension of nomenclature. 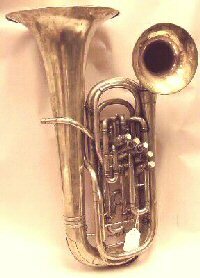 The tenor Saxhorn is today called the baritone, and even today’s euphonium is often referred to as the baritone horn. These terms also serve to confuse the distinction between these two instruments. Because the circa 1820 tenor basshorn incarnation of the euphonium is coincident with the early addition of valves to brasswinds, a connexion with lower-voice conical bore brasswinds is inferred, placing this instrument in the category of a valved, as opposed to keyed, ophicleide, making it an early 19th century incarnation of the Serpent. This, too, places the euphonium in the tuba, rather than the Fluegel camp. Because of the euphonium’s big, pleasing, transparent tone and wide range, spanning from tenor to bass registers, the euphonium was an immediate hit with performers, band directors and composers alike. For the composer\arranger, the instrument is as forgiving range-wise as it is expressive; for the performer, it can handle all or more than the performer demands of it; for the band director, the euphonium represents a large, flexible piece of the overall tone-palate. There are two possible meanings for the Greek-derived name this instrument bears: “sweet voiced” or “great voiced.” It is quite possible that both versions were implied, by someone well-versed in the Greek language. The euphonium has often been a compensating instrument since 1874, when the Blaikely compensating system was employed. There have been helicon (bombardon) and oval incarnations of the euphonium. 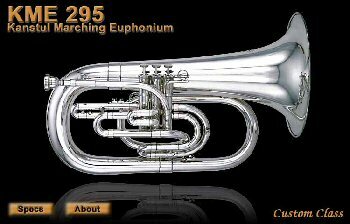 The euphonium has had as many as five valves, both rotary, piston, and combinations of the two. The valves have been placed in line, at an angle, in separate groupings of three and two or three and one, and the valves have been placed on the horn in a variety of locations. The euphonium has been built with the bell variously straight-up, forward facing, directional, slightly flared like a Saxhorn, widely flared like a Sousaphone, and side-facing. The double-bell euphonium came with both fixed and directional bells, or with one fixed and one directional bell, most often with the smaller bell forward-facing. The smaller bell was said to have been contrived to cover the sound of the valved trombone, but as the trombone is a cylindrical-bore instrument, this claim, if true, is based on a misconception. The closest brass member this sound could hope to emulate would be the baritone\tenor Saxhorn. The euphonium also comes in marching form, shaped like an over-large cornet.